It was the Golden Globe Awards last night in Los Angeles (January 6). A ceremony where film and TV stars give awards to other film and TV stars for being such good film and TV stars. The Freddie Mercury biopic, Bohemian Rhapsody, walked away with two awards, including Best Drama Actor for Rami Malek, while Green Book, a comedy-drama starring Viggo Mortensen and Mahershala Ali, scooped three prizes. Jim Carrey was in attendance on the night, as his new show Kidding was nominated for Best Television Series – Musical or Comedy, while the actor was also up for Best Performance by an Actor in a TV series – Musical or Comedy, for his role as Jeff Piccirillo in the show. However, rather than promote the series, Carrey more notably used the evening to promote his next film – a live action adaptation of Sonic the Hedgehog. Never one to shy away from the spotlight, Carrey was involved in an awkward and definitely 100 per cent unplanned situation with hosts Andy Samberg and Sandra Oh, in which they had to ‘kick him out’ of the movie section of the audience and move him to the TV section. But I just finished a film, it’s called Sonic the Hedgehog, comes out in November! Well, y’know, come back next year, I’m sure it’ll be nominated. Naturally, the funny moment captured the attention of many fans, who’ve been waiting patiently for the Sonic film to drop ever since it was announced last year. Carrey plays the evil Dr. Robotnik, while Ben Schwartz voices the titular character. Little is known about the plot, while just a few teasers have been leaked here and there. If Carrey is to be believed – and why wouldn’t he be – then with the film out in November, we should be getting an official trailer fairly soon. 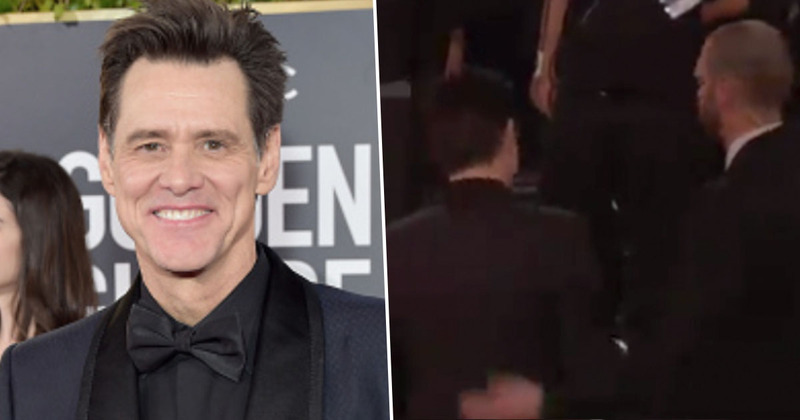 It seems Carrey used the awards ceremony to confirm something else too – his relationship with Kidding co-star Ginger Gonzaga. The pair arrived at the Hollywood ceremony together, and walked the red carpet arm-in-arm. A rep for Carrey confirmed to People the two are an item. Most partial to this talented nominee. This is Carrey’s first public relationship since the death of his ex-girlfriend Cathriona White in 2015. His role in Kidding marks Carrey’s return to the screen, following a period of relative isolation. I relate to this character on the level of somebody who has tried to bring joy and goodness through my work to the world, whose intention has always been to free people from concern. You’re always waiting for that thing that you recognise as some part of yourself that you’ve experienced or haven’t been able to express yet, and also what you’re equipped to express now, after whatever life experience I’ve had in the last little while. Although Kidding may not have won any awards, it’s a welcome return for Jim to our screens… and awards ceremonies.